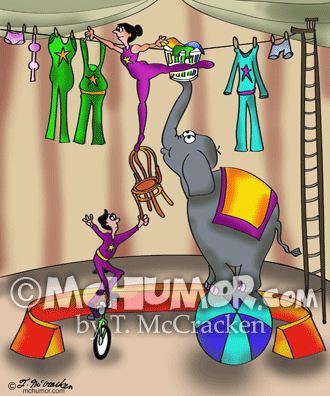 Circus Cartoon 9376: Laundry hangs from a circus tightrope. 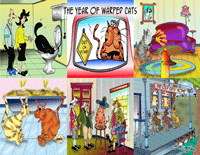 It’s put there by an acrobat standing on a chair held by a man on a unicycle. Her basket is held by an elephant standing on a ball. 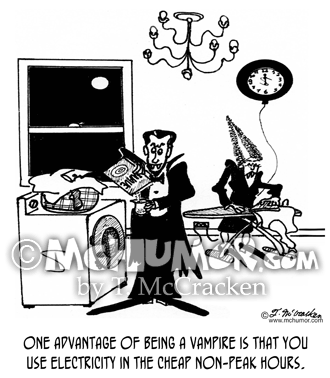 Electricity Cartoon 1618: Dracula and his bride at night, he’s loading a washer, she ironing, and all the lights in the house are on: "One advantage of being a vampire is that you use electricity in the cheap non-peak hours." 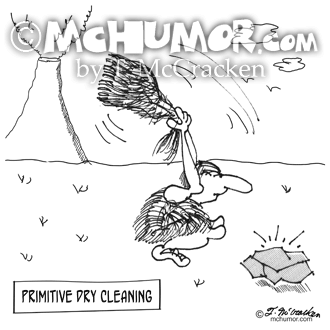 Dry Cleaning Cartoon 2892: “Primitive Dry Cleaning” A caveman beats a pelt against a rock. 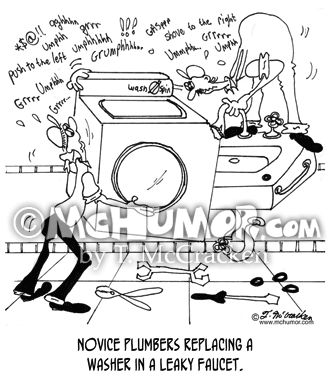 Plumber Cartoon 6433: "Novice plumbers replacing a washer in a leaky faucet." 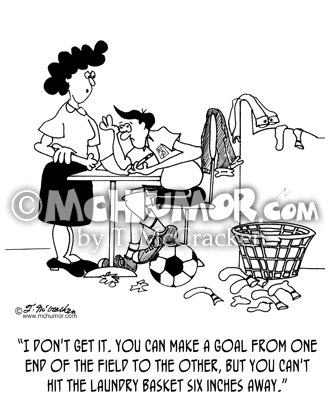 Men try to shove a washing machine into a faucet. 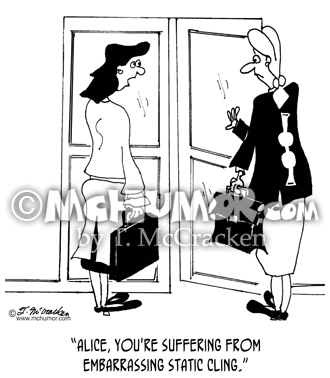 Fashion Cartoon 7309: Someone saying to a woman with a bra stuck on the back of her jacket, "Alice, you're suffering from embarrassing static cling." 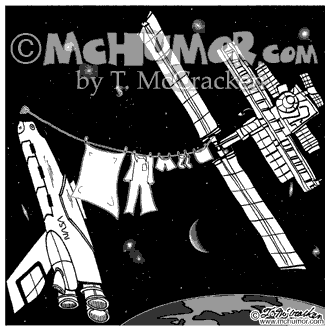 Fashion Cartoon 2891: A dry cleaner holding up a dirty shirt says, "You don't need me. 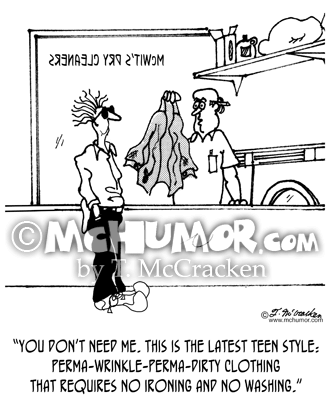 This is the latest teen style: perma-wrinkle-perma-dirty clothing that requires no ironing and no washing." 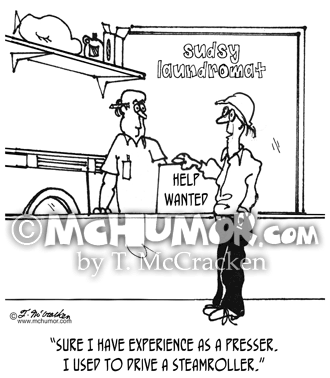 Steamroller Cartoon 3589: A prospective employee at a laundromat says, "Sure I have experience as a presser. 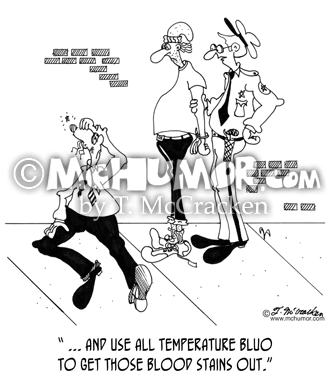 I used to drive a steamroller."